While many people are turning to the newest in memory foam and latex mattresses, there are still plenty of folks who prefer the feel and qualities of a traditional innerspring mattress. After all, these mattresses offer the best bounce and cooling abilities out of any type of mattress. Moreover, sometimes people just want the experience they’ve always had from a mattress. Just because innersprings are the oldest type of mattress design doesn’t mean that they haven’t benefited from the huge leaps and innovations the mattress industry has made in the past few decades. There’s an increasing number of hybrid mattresses that pair the best of memory foams with the best that innerspring and coil mattresses to produce a revolutionary new sleep product. This guide will go over the benefits of innerspring mattresses, and then go over some of the different things you should know if you’re going to be shopping for an innerspring mattress. 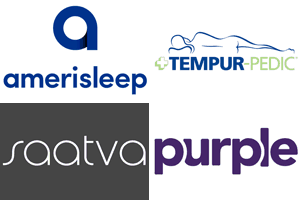 Finally, we’ll list some of our favorite innerspring, coil, and hybrid mattresses that you can find on the market today. There are plenty of benefits to using an innerspring design for mattresses. After all, there’s a reason why this design has been so successful for so long. The first benefit that you get from an innerspring mattress is cooling. As we covered in our guide to cool mattresses, airflow is the most important factor for determining how cool a mattress will sleep. Because innerspring mattresses have large empty areas around the springs or coils, there is plenty of room for air to move around. Anytime you move the bed compresses and rises in a different location, which helps pump air around the mattress. The result of this is that you’ll not find a mattress that sleeps cooler than an innerspring design. Innerspring and coil mattresses also offer much better bounce than other types of mattresses. In addition to being fun to jump on, the bounce of a mattress influences many things. A mattress with more bounce is easier to get into and out of, as the mattress works to help you on your way. A bouncy mattress also makes adult playtime more fun. Another benefit you get with innerspring mattresses is that they come in a huge variety. Companies have figured out how to make different kinds of innerspring mattresses with different qualities like firmness, bounce, and support. Innerspring mattresses also come in a diverse range of prices. That means you can find one to fit your budget, no matter what your budget is. Moreover, because the techniques for making these mattresses have been tested so thoroughly, you can get higher-quality designs and materials for a lower price. Finally, innerspring mattresses typically have less of a smell to them when they’re new than foam mattresses carry. This is one of the benefits of having minimal if any foam in mattress, as the chemical smell that people sometimes associate with new mattresses comes from the foams used in the construction. Now that you understand all that innerspring mattresses have to offer, you’ll have to understand coil counts so that you can determine the best innerspring mattress for you. 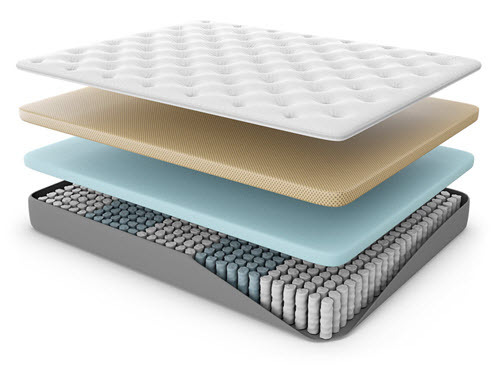 Coil counts are a way to express how many coils are in a given area of an innerspring mattress. Different counts and densities of coils have a large part to play in how supportive and comfortable a mattress will be. A general guideline is that the more coils a mattress has, the more comfortable and supportive it will be. This works on a similar principal to the magic trick of walking on nails. If you try to step on a single nail it will puncture your foot, because all of your body’s weight is focused on one point, the point of the nail. However, if you step on a tight grid of nails, then your body’s weight is spread evenly among them, preventing the nails from puncturing your foot. In the same way, the more coils a mattress has, then the more points of contact it will have with your body. The greater the number of points of contact, the less you’ll feel each individual point. Furthermore, mattresses with a greater number of coils generally are more responsive to your body, and do a better job of creating hug and contour as there are enough coils to more closely mold the mattress to the shape of your body. The coil count you need is influence by the types of coils that are in your mattress. We’ll go over the different types of coils and springs in a moment, but the big difference here is how the coils work as a system. In a traditional setup, like Bonnell coils, all of the coils are joined together by a metal rail, so when one coil gets pressure that pressure is spread across all of the coils in the row. That means you can get by with fewer coils and still be comfortable. Pocketed coils, or coils that operate independently of one another, offer their own benefits, but they don’t get to spread the pressure to other coils in the line, so a higher coil count becomes necessary for comfort. Over there years several different varieties of coils have been developed. We’ll cover the most popular ones still used in mattresses today. The first type of coil used for mattresses, Bonnell coils have an hourglass shape and expands or compresses based on the pressure applied. The coils are set out in a row and then joined together using a lacing technique that connects all the coils. This system is most often used by less expensive mattresses, although they can still offer a quality sleep. Pocketed coils are individually wrapped in thin fabric that are then joined together in the bed. They operate independently, which sets them apart from Bonnell coils. This helps limit the hug and motion transfer of a mattress, but also increases its price. Offset coils are like Bonnell coils but have a straight side instead of a rounded top. The result is a better hinging action and less gap between the coils. Continuous coils are made from a single piece of wire that is twisted and turned to form the individual coils. This is generally used for the cheapest mattresses and suffers from a lot of motion transfer, as all of the coils are part of the same piece of material. 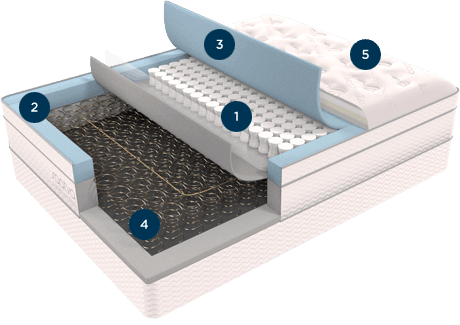 Hybrid mattresses use a foam top layer that is supported by coils underneath. The foam top layer is typically made with memory for or latex foam, and it offers the hug and contour properties of those materials. The springs in these mattresses are usually pocketed coils.